Black Mirror was the most in-demand digital original in Hungary for the week ending October 7, in a list heavily comprising Netflix titles, according to Parrot Analytics’ latest statistics. 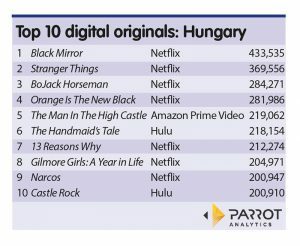 Parrot’s list of the top 10 digital originals in the Hungarian market for the week October 1 – 7 was dominated by Netflix, which accounted for seven of the 10 most-popular shows – Black Mirror leading the way with 433,500 demand expressions. Netflix’s Stranger Things placed second with 369.600 demand expressions, followed by BoJack Horseman in third with a demand score of 284,300 and then Orange is the New Black with an average of 282,000 demand expressions. Amazon Prime Video’s The Man in the High Castle, the first non-Netflix original on the list, ranked fifth with a demand score of 219,100, while Hulu’s The Handmaid’s Tale followed in sixth place. The only other non-Netflix title to appear on the list was Hulu’s Castle Rock in tenth place, slightly behind Netflix’s and Colombia-set drug-trafficking drama Narcos. The seventh and eight spots were occupied by 13 Reasons Why and Gilmore Girls: A Year in Life, respectively.